It’s come to my attention that 2012 Topps Series One hits store shelves in just one week, which means if I’m going to finish my 2011 Phillies Year in Review posts before they arrive, I better get about completing them. When I started this little endeavor, picking my favorite autograph card of the year seemed like an obvious category. However, it turns out that I did not actually collect very many 2011 autograph issues. The primary reason for this is the sheer expense of so many Phillies autograph cards — i.e., the small print runs and popularity of the players most likely to receive such treatment makes the cards somewhat expensive. Cliff Lee, Roy Halladay, Chase Utley, Ryan Howard and Shane Victorino seemed to dominate the Phillies autograph issues this year — with Victorino easily being the least expensive of the bunch. Furthermore, this past year, there just weren’t any cards like the 2010 Topps 206 Brian Schneider or the 2010 Topps Allen & Ginter’s Placido Polanco. 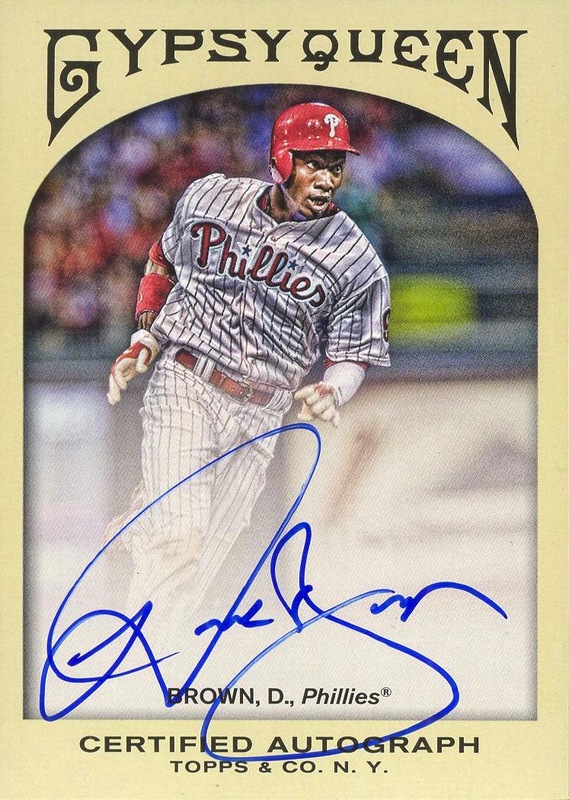 In 2011 Domonic Brown was just about the only Phillie, other than Victorino, whom you could inexpensively acquire on an autograph. Now, those aren’t the only reasons why I picked up so few 2011 autograph issues. The other is Topps’s unceasing fetish for issuing autograph cards of players who won’t, and this is if they’re lucky, step foot onto a Major League field for another 2-3 years — if ever. 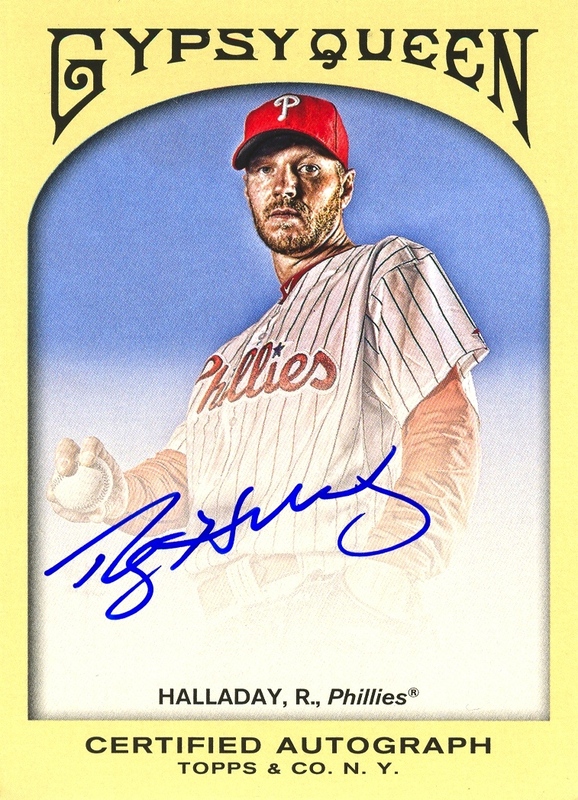 (The Justin De Fratus card may ultimately go down as Topps’s luckiest autographed Phillies rookie card ever.) Yes, I could easily and cheaply pick up autograph cards of Larry Greene, Domingo Santana, and Sebastian Valle, but thanks to the likes of Elio Serrano, Jorge Padilla, and Sean Gamble, I decided approximately a decade ago that I would never again purchase the autograph card of a prospect until it appeared, at an absolute minimum, that his debut appearance in an actual game in a Phillies uniform appears incredibly likely and/or imminent. Because of that, I didn’t pick up my first Joe Savery autograph card until three years after it was issued. This also led to my spending some time in December searching for a 2008 Bowman Draft Signs of the Future Freddy Galvis card before ultimately deciding to wait out and see if he will ever actually appear in a Phillies uniform in anything other than a Spring Training game. For all those reasons, I find myself in a position where it turns out that in one form or another I’ve already discussed and/or posted my favorite autograph cards from last year. Rather than write all about them again, I’ll just link to my original post about each of the year’s nominees and just announce a winner. But before I do so, there is one card I want to write something about first: the 2011 Topps Lineage 1952 Autographs Victorino card. I know I’ve already written plenty about how much I feel that while Topps really screwed the pooch with the Lineage offering, the inserts helped save the set. However, what I have avoided addressing until now is the butchering of Victorino’s autograph insert. 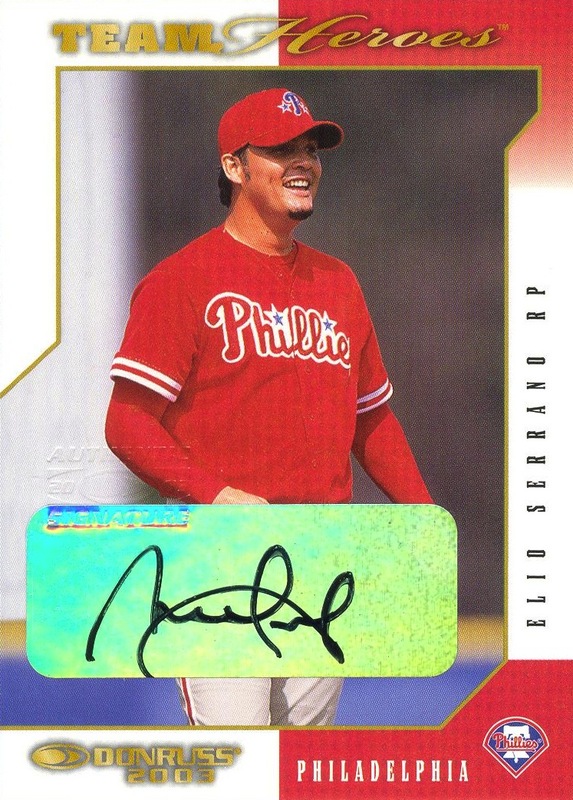 The reason for it was quite simple: Topps decided that they would just use an autograph sticker for this particular card, rather than have Victorino sign the actual cards. As a result, the white box containing his autograph is ridiculously oversized. It would be great if I could place it alongside all the other 1952-style autographs that Topps has issued over the past 10 years, but it looks comically grotesque next to them. 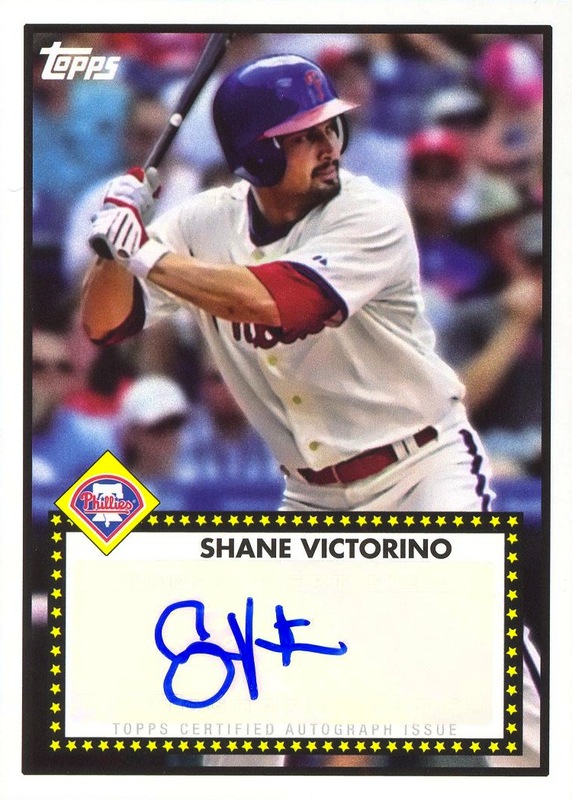 Thankfully, I have plenty of other Shane Victorino autograph cards in my collection, which makes it a lot easier to for me shrug off this travesty and accept it for what it is. I really try to avoid reposting a card twice, but if there was ever a card that deserved it, it was this one. Given the cost of Roy Halladay autograph cards, chances are very good that this will be the only one in my collection, and as such it will always remain one of its centerpieces. There are a couple other Halladay Gypsy Queen autographs in different formats, and while I would love to have both of them, I don’t think either would have the same impact as this one did on me when I received it in the mail. 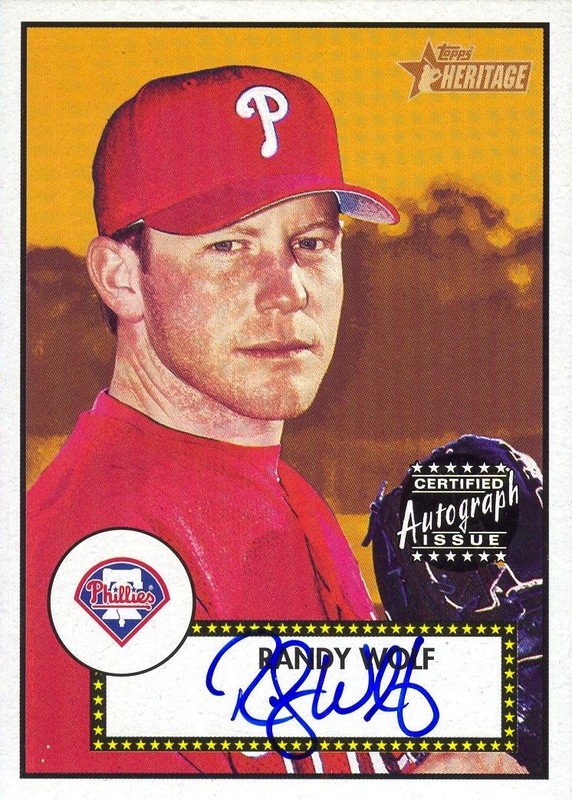 In fact, there are very few cards at all (by that, I mean Phillies cards of all types) that would bring the same level of enjoyment that this one did when it officially became a part of my collection.